Leave it to a state as big as Texas to have two independence days. Each year, along with shooting off fireworks on July 4th, the Lone Star State also sets aside March 2nd to honor the day back in 1836 when the state declared its independence from Mexico, sparking the Texas Revolution which ended in its annexation to the United States. What better flower to celebrate this historical holiday than one that appears in a song about a key battle for Texan independence- the yellow rose. “The Yellow Rose of Texas,” is an old folk song dating back to the time of the Texas War of Independence. According to legend, it was written about a woman, Emily D. West, who was an indentured servant seized during the looting of Galveston. Born in the east, Emily West was a free woman of color and migrated to Texas where she worked as a housekeeper before being captured. Said to have seduced General Santa Ana, allowing Sam Houston and his army to easily win the Battle of San Jacinto, leading to the capture of Santa Ana and the creation of the independent Republic of Texas. A key figure in the fight for independence was Sam Houston, an American politician and general who led troops in several key battles of the war. Coincidentally, Houston was born on March 2nd as well, making the day doubly symbolic in the history of Texas. 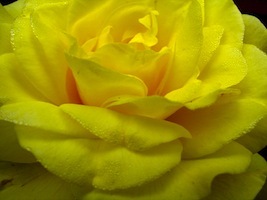 Yellow roses are some of the most fragrant of the species. Grown in landscapes as prolific summer bloomers, florist also carry long stems of the hybrid tea variety all year long. After a month of Valentine’s Day red, the yellow rose will stand out proudly in a vase mixed with pretty wildflowers such as Monte Casino daisies or tall, purple liatris. Choose ones that are still somewhat closed with a firm center, as these will open slowly, petal by petal, over the next week. While the writer of the song, “The Yellow Rose of Texas,” has been lost to history, its lyrics have spanned many generations and several versions, including a billboard hit in 1955, and continues to be a popular song in the Long Star State. Enjoy it with a fresh vase of flowers.